Trans-fatty acids (TFA) are known as a risk factor for coronary artery diseases, insulin resistance and obesity accompanied by systemic inflammation, the features of metabolic syndrome. Little is known about the effects on the liver induced by lipids and also few studies are focused on the effect of foods rich in TFAs on hepatic functions and oxidative stress. This study investigates whether high-fat diets with different TFA levels induce oxidative stress and liver dysfunction in rats. Male Wistar rats were divided randomly into four groups (n = 12/group): C receiving standard-chow; Experimental groups that were fed high-fat diet included 20% fresh soybean oil diet (FSO), 20% oxidized soybean oil diet (OSO) and 20% margarine diet (MG). Each group was kept on the treatment for 4 weeks. A liver damage was observed in rats fed with high-fat diet via increase of liver lipid peroxidation and decreased hepatic antioxidant enzyme activities (superoxide dismutase, catalase and glutathione peroxidase). The intake of oxidized oil led to higher levels of lipid peroxidation and a lower concentration of plasma antioxidants in comparison to rats fed with FSO. The higher inflammatory response in the liver was induced by MG diet. Liver histopathology from OSO and MG groups showed respectively moderate to severe cytoplasm vacuolation, hypatocyte hypertrophy, hepatocyte ballooning, and necroinflammation. It seems that a strong relationship exists between the consumption of TFA in the oxidized oils and lipid peroxidation and non alcoholic fatty liver disease (NAFLD). The extent of the peroxidative events in liver was also different depending on the fat source suggesting that feeding margarine with higher TFA levels may represent a direct source of oxidative stress for the organism. The present study provides evidence for a direct effect of TFA on NAFLD. Various food processing techniques have been found to leave deleterious effects on the processed foods and fats and oils are no exception [1–3]. In the developing nations, the intermittent use of reprocessed thermoxidised oil is widespread . Due to their long shelf life, their suitability during deep-frying and their semisolidity, partially hydrogenated vegetable oils are used by the food industries to enhance the palatability of baked goods and sweets. In the process of hydrogenation, unsaturated vegetable oils undergo the introduction of hydrogen gas under certain conditions of pressure and temperature using a catalyst metal (nickel, palladium, platinum, and ruthenium). The hydrogenation process involves the transformation of certain unsaturated fatty acids from cis to trans configuration. In their natural form, most fatty acids present only cis- isomerism . Trans fatty acids (TFAs) are produced through the industrial hardening of the vegetable oils to make the products more stable and robust, and thus easier to handle or store . Most TFA have physical properties similar to saturated fatty acids (SFA) . More specifically, monounsaturated TFA isomers with 18-carbon chain length (trans-18:1) are some of the predominant TFAs present in the human diet [8, 9]. TFAs are known as a risk factor for coronary vascular diseases (CVD), insulin resistance and obesity accompanied by systemic inflammation, the features of metabolic syndrome [10, 11]. Recent studies suggest multiple possible mechanisms that might mediate the association of TFAs with CVD . For example, TFAs influence prostaglandins balance, which in turn promotes thrombogenesis  and inhibits the conversion of linoleic acid to arachidonic acid and to other n-6 PUFA, perturbing essential fatty acid metabolism and causing changes in the phospholipid fatty acid composition in the aorta . TFAs have been associated with the activation of systemic inflammatory responses, including substantially increased levels of IL-6, TNF-α, TNF receptors and monocyte chemoattractant protein-1 . Furthermore, TFAs have been associated with increased levels of several markers of endothelial activation, including soluble intercellular adhesion molecule 1, soluble vascular-cell adhesion molecule 1 and E-selectin . TFAs are postulated to be involved in promoting vascular dysfunction, as reflected by a reduction in brachial artery flow . These observations suggest that TFAs are linked to the development of CVD, probably via a vascular pro-inflammatory response . Oxidative damage is a major contributor to the development of CVD. Nevertheless, little is known about the effects on the liver induced by lipids  and few studies are focused on the effect of foods rich in TFAs on hepatic functions and oxidative stress. Oxidative stress results from an imbalance between oxidant production and antioxidant defenses . Oxidative stress induced by free radicals has been linked to the development of several diseases such as cardiovascular, cancer, and neurodegenerative diseases . When cellular antioxidant mechanisms are overwhelmed, a long-term decline in their antioxidant capacity causes the oxidative stress [20, 21]. Oxidative stress is now believed to be an important factor in the development of non alcoholic fatty liver disease (NAFLD) [20, 22]. NAFLD is the most common liver disorder in the world, and in obesity, type 2 diabetes and related metabolic diseases, its incidence reaches 70-90% . The disease is characterized by the accumulation of triacylglycerols inside liver cells, and the condition can progress into more serious liver disease, such as non alcoholic steatohepatitis, liver fibrosis, cirrhosis, and more rarely, liver carcinoma . Previous works have shown that feeding rats a high fat diet (57% of energy from fat) induces hepatic steatosis and liver damage, which are characteristic of NAFLD and thus provides a suitable model for the early stages of the disease [24, 25]. But, in these studies TFAs in the fat diet were not investigated and neglected. Therefore, it is necessary to examine the relationship between the liver functions and TFAs consumption in dietary lipids. We investigated whether high-fat diet (fresh soybean oil, oxidized soybean oil and margarine) with different TFA levels induces oxidative stress and NAFLD in rats. Soybean oil and margarine were purchased in a local supermarket. The thermoxidized oil was prepared by heating soybean oil in an oven set for 24 hours at 200°C. The extent of lipid peroxidation was determined by assaying the peroxide value and UV absorbance at 232 and 270 nm (k232 and k270) and p-anisidine value according to the European Official Methods (EEC 2568/91) . the oxidative stability index (OSI) was evaluated by the Rancimat apparatus (Mod. 743, Metrohm Ω, Switzerland) using an oil of 3 g warmed to 120°C and an air flow of 20 L/h . Results were expressed as induction time in hours of hydroperoxides decomposition. Fatty acid methyl esters (FAMEs) from the oil samples were prepared as described by Issaoui et al. . Individual FAMEs were separated and quantified by gas chromatography using a Model 5890 Series II instrument (Hewlett-Packard, Palo Alto, CA) equipped with a flame ionisation detector, and a fused silica capillary column DB-23 (60 m length, 0.32 mm i.d., and 0.25 μm film thickness; HP-Agilent Technologies, Wilmington). The capacity to scavenge the "stable" free radical 2,2-dipheny1-1-picrylhydrazyl (DPPH) was monitored according to the method of Ramadan and Morsel . The solution was incubated at room temperature for 60 min and the decrease in absorbance at 515 nm was determined after 1, 30 and 60 min using a UV-visible spectrophotometer (Perkin Elmer Lambda 25). Male adult Wistar rats (Central Pharmacy, Tunisia), weighing about 200 to 280 g, were housed at 22 ± 3°C, with 12- hour light-dark periods, a 40% minimum relative humidity and free access to water and standard diet: protein 17% (methionine and choline accounting 3000 and 2720 milligrams per kilogram, respectively), carbohydrate 62%, lipids 4%, ash 7%, and moisture 10% (SICO, Sfax, Tunisia). All the breeding phases and experiments were conformable to the rules of the Tunisian Society for the Care and Use of Laboratory Animals. All experiments were conducted at the animal facilities of the faculty of Medicine, Monastir; with the approval of the Faculty of Medicine Ethics committee. After acclimatization to the laboratory conditions for one week, the animals were divided into 4 groups of 12 animals each. Group C included the control animals and received standard chow. Experimental groups that were fed high-fat diet included 20% fresh soybean oil diet (FSO), 20% oxidized soybean oil diet (OSO) and 20% margarine diet (MG). Each group was kept on the treatment for 4 weeks. Water and food consumption and the individual animal body-weight were recorded daily throughout the experiment. At the end of the experimental period, the rats were kept fasting overnight and were sacrificed under diethyl ether anesthesia. Serum Alkaline Phosphatase (ALP) Aspartate Transaminase (AST), Alanine Transaminase (ALT) and Lactate Dehydrogenase (LDH) activities were determined spectrophotometrically using commercial diagnostics kits supplied by Randox Laboratories (Ardmore, Northern Ireland, UK). According to Buege and Aust , lipid peroxidation was estimated by measuring thiobarbituric acid reactive substances (TBARS) and expressed in terms of malondialdehyde (MDA) content. For the assay,125 μl of supernatant (S1) were mixed with 50 μl of saline buffer (PBS, PH 7.4),125 μl of 20% trichloroacetic acid containing1% butylhydroxytoluene and centrifuged (1000 g, 10 min,4°C). Then, 200 μl of supernatant (S2) was mixed with 40 μl of HCl (0.6M) and 160 μl of Tris-thiobarbituric acid (120 mM) and the mixture was heated at 80°C for 10 min. The absorbance was measured at 530 nm. The amount of TBARS was calculated using an extinction coefficient of 1.56 × 10-5 M-1 cm-1 and expressed in nmol of MDA/mg protein. Conjugated dienes were determined by the method of Recknagel and Ghoshal . A portion of tissue homogenate was transferred to a chloroform/methanol mixture (2:1). The whole mixture was vortexed and centrifuged at 2500 g. The upper layer was washed with chloroform/methanol/H2O and centrifuged. The lower layer was combined with the first lower layer and evaporated under N2. The extract was redissolved in 1 ml cyclohexane. Absorbance was determined at 233 nm. An extinction coefficient of 2.52 × 104 mole-1 was used. Results were expressed as mmoles mg-1 protein. Superoxide dismutase (SOD) activity in liver homogenate was assayed spectrophotometrically as described by Beyer and Fridovich . This method is based on the capacity of SOD to inhibit the oxidation of nitroblue tetrazolium (NBT). One unit of SOD represents the amount of enzymes required to inhibit the rate of NBT oxidation by 50% at 25°C. The activity was expressed as units/mg protein. Catalase (CAT) activity was measured at 20°C by a slightly modified version of Aebi's method . Hydrogen peroxide (H2O2) decomposition by CAT enzyme was monitored kinetically at 240 nm. The molar extinction coefficient of 0.043 mM-1cm-1 was used to determine CAT activity. One unit of activity is equal to the micromole of H2O2 degraded per minute per milligram of protein. Glutathione peroxidase activity (GPx) was assayed according to the method of Flohe and Gunzler . The activity was expressed as mmol of GSH oxidized/min/mg of protein at 25°C. Protein concentrations in the liver were determined according to the method of Bradford  using bovine serum albumin as a standard. The data were analyzed using the Statistical Package for Social Sciences (SPSS) program, release 11.0 for Windows (SPSS, Chicago, IL, USA). In each assay, the experimental data represent the mean of 12 independent assays ± standard deviations. Duncan's test was used to determine any significant differences between different groups. The statistical significance was set at p < 0.05. The results were analyzed using the Student t test for comparison between the dietary fat parameters. To point out the correlation between the analyzed parameters, Pearson's test was carried out. The analytical parameters of the dietary fat employed are shown in Table 1. It is very important to assess the oxidative degradation of fats and oils, because free-radical initiated oxidation is one of the main causes of rancidity in fats and oils, which results in the alteration of major quality control variables such as color, flavor, aroma and nutritional value . The thermally oxidized soybean oil (OSO) samples composition were different from the fresh soybean oil (FSO) with a high peroxide, conjugated dienes and p-anisidine value (Table 1) and a significant reduction of oxidative stability (3.74 vs. 0.67 h) and antiradical capacity (93.12 vs. 55.16%), respectively (p < 0.01). Margarine (MG) samples also showed higher antioxidant ability (77.9%) and oxidative stability index (4.27 h) and a lower p-anisidine and extinction coefficient value than OSO (Table 1). *p < .05, OSO vs. FSO; **p < .01 OSO vs. FSO. # p < .05, MG vs. OSO; ## p < .05 MG vs. OSO. Comparison between supplemented-diet compositions was made using unpaired Student t test. 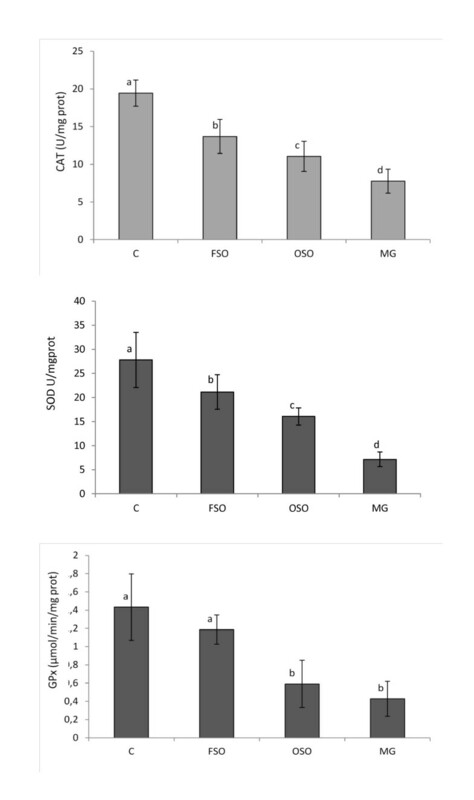 Concerning the fatty acid (FA) composition, as shown in Table 1, FSO and OSO were characterized by the presence of high levels of polyunsaturated fatty acid (PUFA) fraction with a significant (p < 0.01) difference (59.36 vs. 54.21% respectively). Whereas, MG was distinguished by the presence of SFA (41.42%) and a significant low level of PUFA (24.81%). For TFA isomers, FSO contained about 0.22% of total FA (Table 1). Detection of TFA isomers in FSO confirms the fact that the oil retailed in the market even without thermal treatment has already started deteriorating. This also could be due to the refining process effect. MG samples contained higher amounts of total TFAs accounting 10 and 1.23 times than FSO and OSO, respectively. As reported by Assumpção et al. , during hydrogenation, the double bonds of FA that form triacylglycerols change their position and produce trans-geometric isomers. In MG samples, the trans 18:1 n-9 constituted the highest proportion among the identified trans-isomers, whereas polyunsaturated trans-isomers appeared only in small quantities. 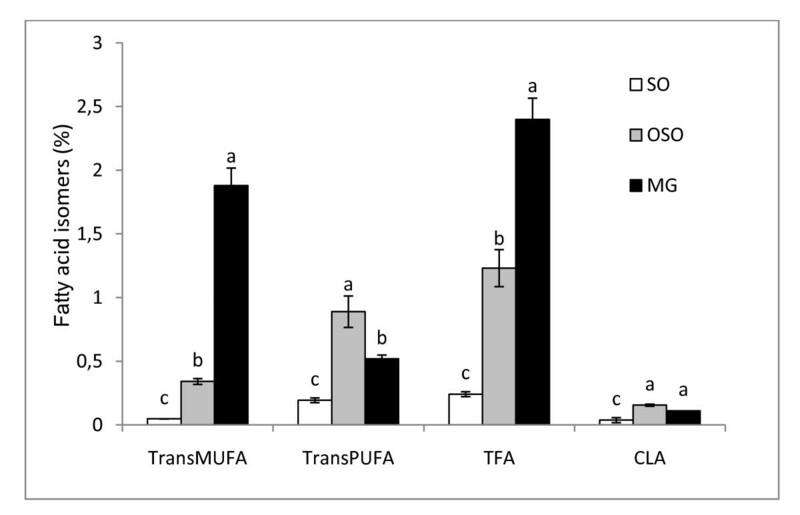 However, for OSO, trans PUFA represent about 60% of total TFA. This is in accordance with Mayneris-Perxachs et al. who reported that the predominant trans isomers in industrially processed products is elaidic acid (trans-9 C18:1) and in agreement with Lichtenstein  who reported that the majority of TFAs in the diet are trans-18: 1, which is derived from the partial hydrogenation of oils. However, the process of heating vegetable oils during deodorization and frying or baking food in vegetable oils results in the generation of trans-18:2 . Thus, Supplemented dietary fat contained different levels of total TFAs ranged from proportions of total fat <1%, <2% and > 2% in FSO, OSO and MG diets respectively (Figure 1). In addition, the isomer type also differs with predominance of trans-18:2 in oils and trans-18: 1 n-9 in MG. In observational studies utilizing biomarkers of TFAs consumption, both 18:1 and 18:2 isomers appear to contribute to risk of CVD . Fatty acid isomers in dietary fat diet. trans MUFA: trans monounsaturated fatty acid, trans PUFA: trans polyunsaturated fatty acid, TFA: total trans fatty acid, CLA: conjugated linoleic acid. Data are expressed as means ± SD (n = 3). Comparison between groups was made using Duncan's test. Values followed by different subscript letters are significantly different. (p < 0.05). Most rats gained weight consistently during the four-week dietary treatments. The average body weight gain at the end of the four weeks was 16.4 g in the control animals, 24.55, 20.33 and 25.83 g in FSO-fed, OSO-fed and MG-fed rats, respectively (Table 2). Following four weeks of feeding, the body weight gained in high-fat fed rats was statistically not significant (Table 2). 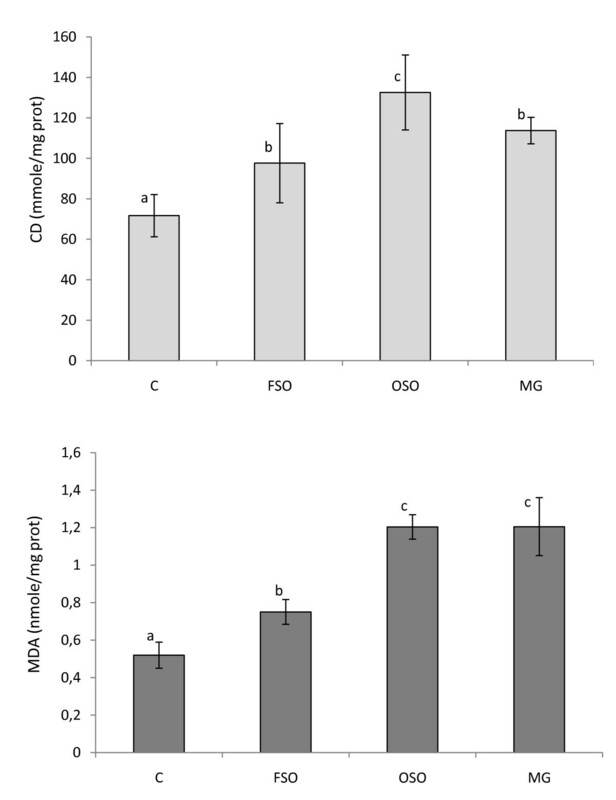 The feeding efficiency of rats fed with the OSO diet was lower than that of the FSO-fed rats. This may be explained by the fact that almost all amino acids react with primary and secondary products of oxidized lipids, thereby decreasing the digestive utilization of protein, amino acids and fats, which may affect a weight gain . On the other hand, results showed that FSO diet significantly increased the absolute liver weight compared with the control group. However, no significant changes were observed for OSO and MG groups (Table 2). Body weight gain, food intake, water intake and feed efficiency of rats fed with fresh soybean oil (FSO) oxidized soybean oil (OSO) and margarine (MG). Data are expressed as means ± SD (n = 12 rats per group). Control group: C; Fresh soybean-oil fed group: FSO; oxidized soybean oil-fed group: OSO; margarine-fed group: MG. Comparison between groups was made using Duncan's test. Different parameters values followed by different subscript letters (a, b and c) are significantly different between groups. (p < 0.05). The levels of plasma hepato-specific enzymes such as, ALP and LDH were significantly increased (p < 0.05) in high-fat fed rats compared to control (Table 3). Feeding (OSO) led to significant higher levels of AST, ALP and LDH in comparison to fresh oil fed group (p < 0.05). Enhanced levels of plasma ALT and AST are indicative of liver damage . Plasma ALP is a sensitive detector for intrahepatic and extrahepatic bile obstruction . It is well known that dietary fat sources strongly influence several biochemical variables both in plasma and in biological membranes [45–47]. Consumption of OSO and MG diets causes a significant increase of biochemical indicators of liver damage. We noticed a close positive correlation between TFA levels in dietary fat and AST, ALAT, ALP and LDH (Table 4). These results revealed hepatic damage in rats consumed TFA. Comparison between groups was made using Duncan's test. Different parameters values followed by different subscript letters (a, b and c) are significantly different between groups. (p < 0.05). *p < .05, OSO vs. FSO group; **p < .01, OSO vs. FSO group. +p < .05, MG vs OSO group; ++p < .05, MG vs. OSO group. Comparison between groups was made using unpaired Student test. MUFA: monounsaturated fatty acid; PUFA: polyunsaturated fatty acid; TFAs: trans fatty acids; alkaline phosphatase: ALP; aspartate transaminase: AST; alanine transaminase: ALT; lactate dehydrogenase: LDH; SOD: superoxide dismutase; GPx: glutathione peroxidase; CAT: catalase; CD: conjugated dienes; MDA: malondialdehyde. When compared to control group, we found a clear evidence of liver's lipid peroxidation of FSO, OSO and MG-fed rats, as judged by their significantly high content of conjugated dienes (CD) products, reflecting the initial phase of lipid peroxidation. On the other hand, when the degradative phase of lipid peroxidation was examined, assaying thiobarbituric acid reacting substances (TBARS), the MDA levels in the FSO group, comparing to the C group, was increased by 26.5% (Figure 2). The TBARS in the livers of high-fat fed animals were found to be significantly increased compared to control rats (p < 0.05). Elevated levels of TBARS in liver are a clear manifestation of excessive formation of free radical and activation of lipid peroxidation. Malondialdehyde (MDA) and conjugated dienes (CD) in the liver of rats fed with high fat diet with different trans fatty acid levels. C: controls group, FSO: Fresh soybean oil fed group, OSO: oxidized soybean oil-fed group, MG: margarine-fed group. Data are expressed as means ± SD (n = 12 rats per group). Comparison between groups was made using Duncan's test. Values followed by different subscript letters are significantly different. (p < 0.05). Our findings revealed that the rates of hepatic lipid peroxidation were markedly higher in margarine and OSO-fed groups than in the fresh oil fed group. However, for OSO-fed group, the CD concentration was significantly increased by 85% and 36% of that in C and FSO group respectively. The results from lipid peroxidation measurements confirm that the loss of antioxidant capacity and the increase of TFAs in OSO affect the liver function, suggesting that feeding oxidized oil may represent a direct source of oxidative stress for the organism. A positive correlation between the level of total TFAs in the diet and the concentration of the TBARS in the liver of high-fat fed animals (r = 0.84) was observed. A highly significant positive correlation was also noted between CD levels in rat's liver and trans PUFA in the rat diet (r = 1.0; p < 0.01) (Table 4). The importance of FAs resides in the finding that biological membranes adapt their composition according to that of dietary fat [48–50]. Dietary FAs can influence the susceptibility of cells to oxidative stress, perhaps due to changes in cell membrane FA composition . As well known, lipid peroxidation starts with abstraction of OH• from a -CH2- group of PUFA, where the carbon radical is usually stabilized by a molecular rearrangement forming conjugated dienes, compounds containing two double bonds separated by a single bond. Conjugated dienes react with O2 forming peroxyl radicals that react with OH• atoms from other lipids, producing lipid hydroperoxides or forming cyclic peroxides, and several products are formed, including MDA . Lipid peroxidation is the process of oxidative degradation of PUFAs and its occurrence in biological membranes causes impaired membrane function, structural integrity, decrease in membrane fluidity and inactivation of a several membrane bound enzymes . Niu et al. have reported that phospholipids in biological membranes containing TFAs are known to attract cholesterol . This phenomenon plausibly alters cell membrane structure, including redefining lipid raft and non-raft regions in size, organization and composition. Lipid rafts are important for cellular signalling, as they provide docking sites for receptors, co-receptors and mediators including adhesion molecules . Recent animal experiments indicate that TFAs impair fat cell membrane fluidity. When TFAs are incorporated into cell membranes, the membrane fluidity is reduced and the cells do not function as well. The resulting effect is then to promote further production of reactive oxygen species which explain the increase in lipid peroxidation in groups fed with TFAs diet. The removal of reactive oxygen substances is accomplished by enzymatic and non-enzymatic reactions in biological systems. In enzymatic reactions, SOD converts superoxide anions to hydrogen peroxide (H2O2), and H2O2 can be rapidly degraded by CAT and GPx to H2O . The activities of SOD and CAT in the liver were significantly (p < 0.05) lowered in rats fed with high-fat diet than control group animals (Figure 3). Loss of CAT activity results in oxygen intolerance and triggers a number of deleterious reactions such as protein and DNA oxidation, and cell death . The GPx activity was significantly decreased in liver of rats fed with OSO and MG diet as compared to the control and FSO-fed rats (p < 0.05) (Figure 3). High-fat diets can cause the formation of toxic intermediates that can inhibit the activity of antioxidant enzymes  and the accumulation of O2- radicals and H2O2 which in turn forms hydroxyl radicals . The activities of SOD and CAT were significantly decreased in OSO group than FSO group (p < 0.05) (Figure 3). A close negative correlation was noted between TFA levels in the diet and SOD (r = -0.99), CAT(r = -1.0) and GPx (r = -0.93) activities in rat's liver suggesting that increasing consumption of TFAs is associated with the decrease of the efficiency of the antioxidant-enzymatic system and therefore, with the increase of oxidative stress in rat's liver. TFAs may impart their effect by enhancing intrinsic signaling mechanisms leading to a chronic, pro-inflammatory state. Consumption of diets high in TFAs may induce long-term progressive changes in the antioxidant enzyme's activities. Antioxidant enzyme activities in the liver of rats fed with high fat diet with different trans fatty acid levels. CAT, SOD and GPx of rat's liver exposed to different high-fat diets. C: controls group, FSO: Fresh soybean oil-fed group, OSO: oxidized soybean oil-fed group, MG: margarine-fed group. Data are expressed as means ± SD (n = 12 rats per group). Comparison between groups was made using Duncan's test. Values followed by different subscript letters are significantly different. (p < 0.05). 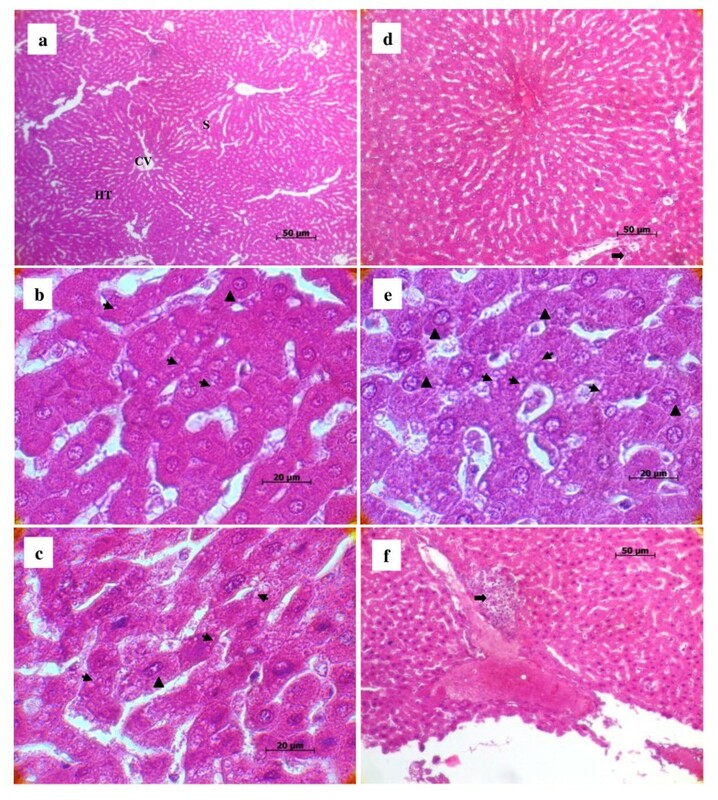 Histopathologically, liver sections from rats fed with the standard diet had shown normal morphological appearance (Figure 4a). Livers of the experimental groups showed a clear difference from those of the control group. In the group that fed FSO, the initial phase of NALFD, during which fat accumulates in the liver (Figure 4b, thin arrow). and cytoplasm vacuolation of hepatocytes were observed (Figure 4b, black triangle). As previously reported by Samuhasaneeto et al. , one hundred percent fat diet caused mobilizing of free fatty acid from adipose tissue and transporting into hepatocytes. These results are in agreement with previous studies of the effects of high-fat diet in inducing the early stage of NAFLD . Effect of high fat diet with different trans fatty acid levels on rat's liver histology. Normal liver histological aspect from a control (H&E 32 ×). Panel (a) it is composed of hexagonal or pentagonal lobules with central veins (CV) and peripheral hepatic triads (HT) embedded in connective tissue. Hepatocytes are arranged in trabecules running radiantly from the central vein and are separated by sinusoids (S) containing Kuppfer cells. Liver from experimental groups (H&E 100×): FSO Panel (b): moderate lipid accumulation is seen in many hepatocytes; OSO Panel (b); abundance of cytoplasm vacuolization and ballooned hepatocytes and MG Panel (e); severe lipid accumulation in hepatocytes and high number of ballooned hepatocytes. Cytoplasm vacuolization in parenchymatous cells of the liver (thin arrow), hypertrophied hepatocytes (black triangle). Liver from OSO Panel (d) and MG Panel (f) groups (H&E 32×): photomicrograph of degenerated hepatocytes and necrosis (thick arrow). Feeding OSO for four weeks, rat's liver showed increased incidences of hepatocytes hypertrophy (Figure 4c, black triangle), fat deposition (Figure 4c, thin arrow) and infiltration of a mixed population of inflammatory cells in the liver, as well as ballooning degeneration of hepatocytes characterized by cell swelling with empty intracellular content, indicating cell necrosis (Figure 4d, thick arrow). As known, dietary lipids in the form of chylomicrons are transported from the gut via the lymphatic system to the liver where they are incorporated after release from lipoproteins by hepatic lipoprotein lipase . Physiologically and during the postprandial phase, dietary lipids are stored in the liver, where they are processed and assembled with apolipoprotein B 100 (ApoB) to form very-low-density lipoprotein (VLDL). These particles are secreted and distribute lipids to lipid-storing adipose tissue . When the hepatocyte is injured, plasma membrane can be disrupted and the leakage through extra-cellular fluid of the enzyme occurs where they can be detected at abnormal levels in the serum . This is clearly evident by a substantial increase in plasma levels of AST, ALP and LDH in OSO group (Table 3). Previous studies have reported that trans fats appear to affect lipid metabolism through several pathways. In vitro, TFAs alter the secretion, lipid composition, and size of apolipoprotein B-100 (apoB-100) particles produced by hepatic cells [62, 63]. The liver failed to synthesize apolipoprotein that was used for packaging and exporting of fat from the liver. Therefore, triglycerides accumulated in the liver . As reported by Mensink et al , trans fats increase the blood levels of triglycerides as compared with the intake of other fats. In this study, triglycerides levels were found to be increased in the plasma of rats fed with MG diet followed by OSO diet and FSO diet (data not published). The higher inflammatory response in the liver was induced by MG diet. Liver histopathology from MG group showed severe cytoplasm vacuolation, hepatocyte hypertrophy ( Figure 4e, black triangle) and a noticeable hepatocyte ballooning demonstrating a large area of necroinflammation (Figure 4f, thick arrow). The histological and pathogenic features of NAFLD were clearly developed in the MG group which is submitted to margarine diet with TFA level reaching the 2% of total fat. Previous studies proved that oxidative stress is now believed to be an important factor in the development of NALFD . These alterations in the liver of rats fed with OSO and MG diet containing respectively more than 1% and 2% TFAs of total fat implicate TFAs in triggering the development of NAFLD and/or accelerating the progression of the disease. In conclusion, oxidized edible oils fed to rats for four weeks induced lipid peroxidation in liver compared with the same non-oxidized oils. It seems that a strong relationship exists between the consumption of TFAs in the oxidized oils and lipid peroxidation. The extent of the peroxidative events in liver was also different depending on the fat source suggesting that feeding margarine with higher TFA level may represent a direct source of oxidative stress for the organism. The present study provides evidence for a direct effect of TFAs on liver dysfunction causing the disturbances in liver lipid metabolism that result in NAFLD which is a key component of the cardiometabolic syndrome. This suggests that TFAs may influence risk factors for CVD. non alcoholic fatty liver disease. This research was supported by a grant from the 'Ministère de l'Enseignement Supérieur et de la Recherche Scientifique" UR03ES08 "Nutrition Humaine et Désordres Métaboliques" University of Monastir and 'DRT-USCR-Spectrométrie de masse. We are grateful to the anonymous reviewers for their valuable comments and remarks. We thank Mr. Arafet Dhibi for the critical review English Grammar of the manuscript. MD carried out the studies, acquired the data, performed the data analysis, drafted and revised the manuscript. FB and AM played a major role in all the experimental procedures of this study. ZH carried out histological observations. IC was involved in the experimental work performed towards this manuscript. LB participates in carrying out of dietary fat analysis. NG provided technical assistance in the chromatographic analysis. MA provided academic helping service in performing this study. MH involved in the design and organization of the study, interpreted the results and revised the manuscript. All authors have read and approved the final manuscript.